Recently, while visiting a sports store I noticed practice cricket balls on sale. These had a length of elastic attached which could be tied onto an anchor of some sort and used for batting practice. This brought back memories of my sons practising their cricket batting when they were quite young. They had a tennis ball knotted into the toe of an old stocking which was hung from a rafter of the pergola outside the back door. 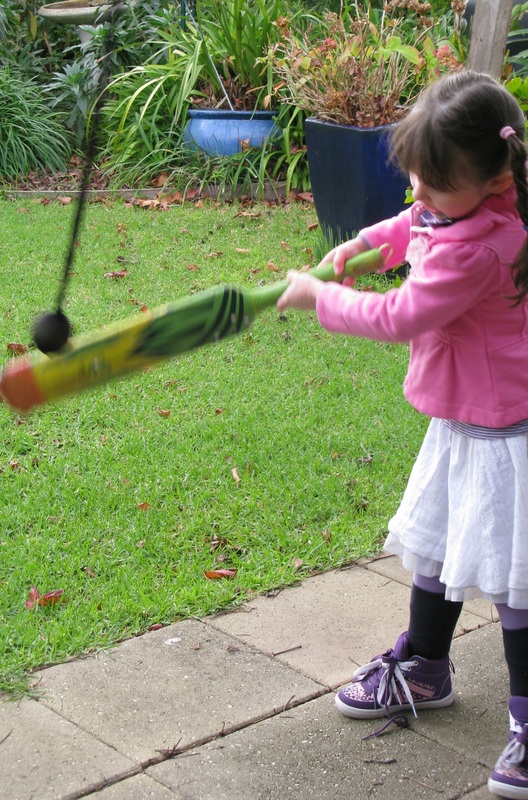 Fast forward 30 years…….I found a tennis ball in the toy box and an old pair of pantyhose and then set up a batting activity in the garden. A great success for boys and girls!